I finished this book just hours ago. 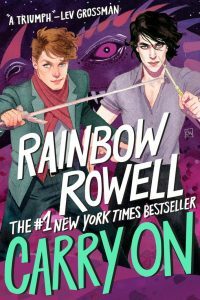 I bought Rainbow Rowell’s Carry On the day after I finished Eleanor & Park, over a year ago. I fell in love with Eleanor & Park, and something about it made me not want to read anything else, for fear of losing the magic I had found in that book. Since, I have read only two books (High Rise by JG Ballard, and The Profession of Violence: The Rise and Fall of the Kray Twins by John Pearson) and have not been particularly hooked by either. Less than a week ago Rowell tweeted the cover of the paperback edition of Carry On, due for release May 2017. Illustrated by Kevin Wada the cover features Simon Snow and Tyrannus Basilton Grimm-Pitch. The illustration reminded me I’d bought Carry On, and I dug it out, determined to start reading it the next day on my way to work. Carry On (and Eleanor & Park) is considered a work of Young Adult Fiction, a genre ‘technically’ published for ages 12 to 18 – an age bracket I have long since passed. I hadn’t picked up my first book by Rowell with any background about her. The title had simply intrigued me – Park is a Korean name, and there aren’t many Koreans in western literature. Though with just one book, Rainbow Rowell had cemented her place on a small list of writers who has left a deep impression on me. So Young Adult Fiction or not, I’m going to keep reading – and Crowley am I glad I did. Carry On features the first magickal world I have fallen in love with since Harry Potter – but Carry On feels grounded, and (at least for me) real. Magic is not spoken in Latin, but in popular phrases and song lyrics. Snow is the Chosen One, but he’s not automatically good at things like Potter was. In fact, he’s rarely good at things, especially magic. Snow feels like the typical Lancashire boys I went to school with – short tempered, rough around the edges, little sense in the way of style, not always particularly smart. One thing that struck me most is the brilliance of Rowell’s British dialect within the book. She is American, and I’m curious whether she once lived in England, is it possible to capture such accuracies through research alone? Either way, I have great respect for her ability to write in such a way. The love I had for Eleanor & Park hit me all most instantly as I delved further and further into Carry On. Both stories are filled with unconventional love that ignores all boundary and discrimination, and I can’t help but love their worlds. I was hooked, and completely invested in Simon, and soon in Baz too. The ending of the Harry Potter Series left me with a fair amount of disappointment, that I still have today. After all the build up I felt a little cheated. As I finished Carry On I too felt disappointment, but this time that the story had ended, I felt like I was leaving Watford too – the end of an era. I was slightly disappointed that Simon never learns who his parents were, but at the same time, I felt completely satisfied that Simon finds family in his friends. His understanding of the importance of Baz’s mother plays a pivotal role in the story, and for a long while had me desperate for Simon to discover his own mother, but that is really not necessary. Simon is not alone, he’s not unloved, his parentage is of little importance to him (it’s somewhat important for us to know) he’s probably better off not knowing. Where Eleanor & Park left me almost afraid to continue reading anything else, Carry On has me eager to find something I love as much. I should probably have read Rowell’s Fangirl before Carry On, as the characters appear as fiction within the fiction of Fangirl, but now it means I have my next read decided – and I can’t wait to fall in love all over again.